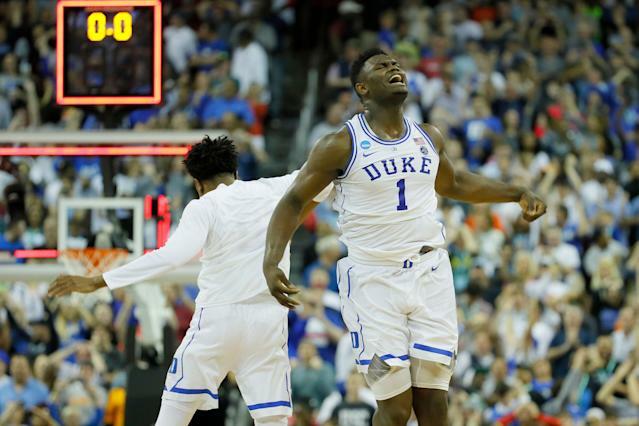 The Duke Blue Devils were national title favorites — the only college basketball team the sports world wanted to talk about, with the biggest college basketball superstar in decades. And on Sunday, they came inches away from not even making it out of the 2019 NCAA tournament’s opening weekend. That the Knights were even in the game was thanks to a father-son duo. 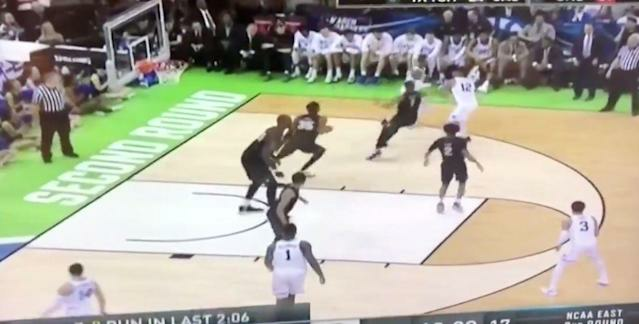 UCF head coach Johnny Dawkins, a Coach K disciple, drew up a masterful gameplan. His son, Aubrey, scored 32 points, and had the Blue Devils on the ropes. But Duke’s big three made three big plays. Cam Reddish hit a 3 to cut UCF’s 74-70 lead to one after that turnover in transition. Williamson used every bit of his superhuman strength on the and-one. And Barrett picked up his roommate by rebounding his miss and winning the game. In coming oh-so-close, the Knights might have shown how to beat the Blue Devils. Dawkins’ gameplan was extreme – borderline revolutionary. It might turn out to be a blueprint. But that won’t be any consolation to UCF. 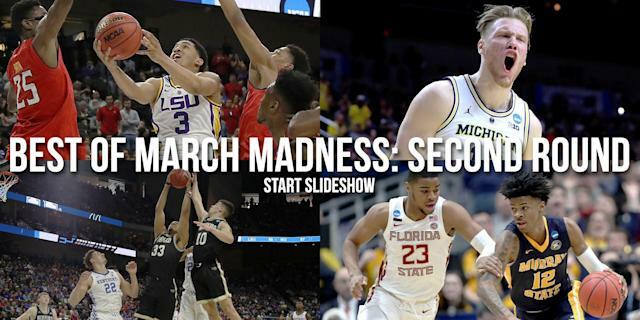 It won’t stem inescapable thoughts of what could have been – what, if one of two layups had been an ounce lighter off the glass, would have made the Knights the biggest story of March. Mike Krzyzewski and Johnny Dawkins know each other well. UCF’s head man played four years under Coach K at Duke, then spent a decade on K’s staff as an assistant. And their battle on Sunday was just as fascinating as Tacko vs. Zion. K made the first major adjustment. He went to a zone press late in the first half to get UCF uncomfortable. And it worked to perfection. It helped force three UCF turnovers and propel a 10-0 Blue Devil run. Duke went to the locker room with a 44-36 lead, and seemingly with the game in hand. Coming out of halftime, though, Dawkins had an adjustment of his own. And this one was even more extreme. At one point, he put Fall on 6-foot-2 point guard Tre Jones. Except Fall didn’t really pay attention to Jones. He hung out in the paint, daring Jones – a 24 percent 3-point shooter – to pull from the perimeter. Jones did a few times, and missed a few times. UCF paid similarly little attention to Jordan Goldwire, a 9 percent 3-point shooter. Instead, it sent double-teams at Reddish and Barrett, and walled off the paint for Williamson. Duke hit just three of its first 18 second-half field goal attempts. UCF came all the way back to take the lead. Then K went back to the zone press. Jones hit one of his wide open 3s. Goldwire hit one as well. So did Williamson. Duke regained a seven-point lead. But Dawkins stuck with the strategy. K and Duke never really figured it out. Goldwire would stand on the left wing, completely ignored – by both UCF and his Blue Devil teammates. Even when K removed him from the game, Duke couldn’t hide Jones, who took and missed another late 3. He was 1-of-8 from beyond the arc for the game. But in the end, Williamson won his matchup with Fall when it mattered most. He and Barrett willed the Blue Devils to the Sweet 16. Both Williamson and Fall has sizable impacts on the game. Fall was awesome, and with him on the court, UCF outscored Duke by 15. His foul trouble, however, limited him to 25 minutes – and in the other 15, Duke outscored the Fall-less Knights by 16. Twice, he denied Williamson at the rim – perhaps with fouls that went uncalled. Williamson, deterred by Fall’s size, stepped out to the 3-point line and hit a few first-half triples. He was 3-of-7 from deep on the evening. It was only fitting that a meeting at the summit would decide the game. Zion and Duke won it. They’ll move on to play either Virginia Tech or Liberty in Washington, D.C.